I am able to admit when I’m wrong. Granted, it tends to be difficult because I’m so out of practice, but it does happen sometimes. And once I get past the shortness of breath and tame my fight-or-flight response, I can own it. Thus, I can say calmly and with no shame: I WAS WRONG ABOUT THE MUSHY PEAS. I mean, you can’t really blame me for being down on the mushy peas, can you? One, anything with “mushy” in the name is doubtful; people don’t usually call something “mushy” in a positive way. Two, peas. Even at their best, when it’s springtime and you can find them fresh, they’re merely tolerable. I do salute frozen peas for making excellent icepacks for a sore knee, but otherwise, they can stay in the freezer. Every few weeks, Brian will bust out his awesome spaghetti carbonara and then desecrate it with peas. I always let them sink to the bottom of the bowl and then pawn them off on him. He loves peas. He also thinks melba toast is a tasty snack and likes pickled herring, so you know: can’t be trusted. *To be fair, I don’t know if this is something people say at all. As we all know, Bad Thing + Bad Thing does not = Good Thing unless we’re talking about Velveeta and Ro-Tel, the commonly known “Queso Aberration.” Still, Brian has had a hankering for mushy peas, and I live to please. 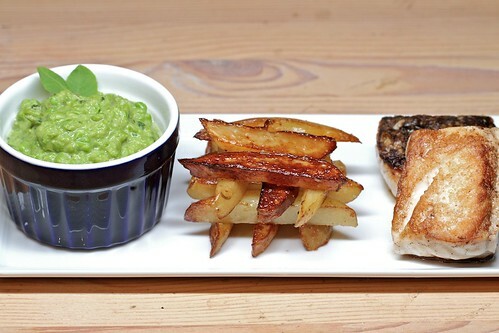 I decided to make the mushy peas more passable by pairing them with a lovely hunk of pan-seared striped bass and some duck fat-fried potatoes. *That’s my kind of internet. My mushy peas were made with frozen peas and, yes, mint. I sauteed a minced shallot in some butter, then poured in a bit of chicken stock and a bag of peas. By the time the peas were heated through, the chicken stock had mostly cooked off, so I dumped the pot into the FoPro and added a little heavy cream, fresh mint, lemon zest and salt. I whizzed ’em until they were half pureed and half rough chunks, kinda like what the dogs vomit up after we take them to the park for the first time in spring and they eat all the grass. Not that I have any preconceived notions about the mushy peas. I tasted the mix to check for seasoning, and I’ll say it again: I WAS WRONG ABOUT THE MUSHY PEAS. 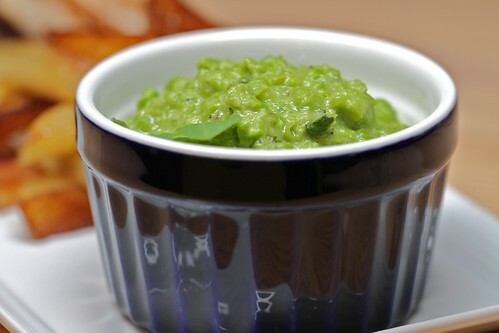 Mushy peas somehow become more than the sum of their parts. The cream enhances their natural sweetness, and the lemon and mint add a freshness that was more than welcome on an unusually warm March evening. Even better were the peas paired with the fish; I know fried fish is more traditional, but I loved the lightness of the pan-seared fish with the mildness and creamy texture of the peas. Now I challenge you: What have you never made because it sounded kinda gross? Go forth and cook, and report back to us. There will be a quiz. Heat the butter in a medium saucepan over medium heat. Add the shallot and saute until translucent, 3-5 minutes. Dump in the stock and let it come to a simmer, then add the peas. Toss ’em around for a few minutes until the stock is mostly gone and the peas are heated through and a nice bright green. Transfer the peas to a FoPro and add the zest, mint, heavy cream and a pinch of salt; pulse 6 or 7 times to get things nice and loose. Check the seasoning, add more salt if needed, and pulse a few more times; there should still be some whole and only partially broken-down peas. If you don’t have a FoPro or like a chunkier texture, you can also do this by hand with a potato masher. Serve immediately, with a nice piece of fish. Next Next post: Romney/Palin in 2012! I love peas, honestly. Can eat a full pound bag with worcester sauce and melted butter. But even I am suspicious of “mushy” peas. Promise they’re not hateful? Also, that picture was nothing short of architectural. Beautiful. that looks awesome! i eat peas for dinner a little too much. just a bowl of them. try a scallion instead of/in addition to shallots, but add it when you add the peas…is nice. I’m afraid I’ll never be a convert. Just the smell of peas makes me want to spend a few minutes talking to ralph on the pocelain phone. If someone tried to put peas in my carbonara, I would cry. But I”m glad it all worked out for you and you enjoyed the mushy peas. Kudos to making it work! I didn’t like asparagus and cauliflower until someone told me to roast them in the oven, or mush up the cauliflower with browned butter in a food processor. Well, I have actually made this, but it took some convincing for me to even taste it the first time (and I was in Italy! ), and I now have the same problem in getting others to try it: Vitello Tonnato. Or turkey tonnato, AS IF I could find veal in this one-store town. It’s a cold, pureed tuna sauce over cold roasted meat and sprinkled with capers. I know, it sounds gross, doesn’t it? And yet it is anything but. @kristie, pinky swear. the zest and mint makes a world of difference, seriously. @rachel, roasted cauliflower changed my life. i mean, not in the same way paxil did or anything, but still. pretty substantial. @peggasus, vitello tonnato is an obstacle i have not yet attempted to surmount. but… ok, ok, MAYBE I’ll give it a shot. Mushy peas are awesome in the same way that mashed potatoes are awesome. There’s a bunch of delicious stuff giving them flavor, they’re creamy, etc. I mean, I am WAY more likely to eat a plain boiled potato than plain boiled peas, but…a plain boiled potato is not actually that great, you know? Mushy peas ups peas’ game the same way. Mushy peas I am so on board with. It’s like, you’re taking regular peas and you’re adding cream. Or maybe creme fraiche or something if you’re being fancy. I know there’s something I tried in spite of myself relatively recently but I’m too asleep to trawl through my blog to find out what it was. I will say though that it’s nice to be proved wrong sometimes. “those breasts were really mushy” – ahahaha. 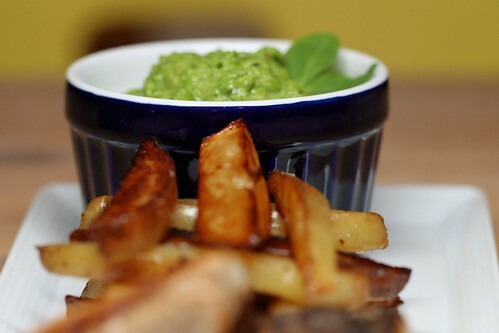 @hungryandfrozen, creme fraiche in the mushy peas? WHY DID I NOT THINK OF THAT? i even have some in the fridge! Myself, I will absolutely not eat avocado. At all. But as it turns out, I will absolutely eat avocado & pineapple macarons. Yum. Yes yes, all well and good, and actually convincing, but excuse me, duck fat fries? Please. Please! 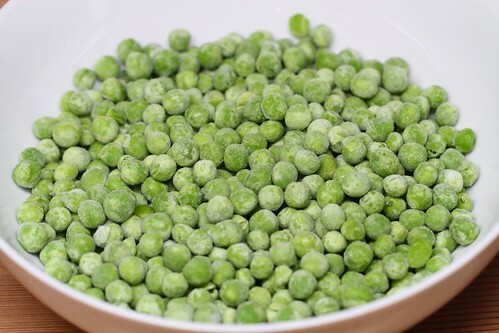 There is an absolutely phenomenal fresh spring pea recipe from Tom Hirschfield’s blog (google it) that calls for raw peas with a dressing of boiled eggs, riced, with horseradish and other stuff. Try it. @kayb, i gotta be honest… that sounds kind of awful. Well … peas. I loathe cooked peas. I only eat them in things where you couldn’t possibly taste them, like soups and Pav Bhaji and stuff. Although. I used to hate squash, too, but now I can eat butternut squash in risotto. Hmm. Hmm. I dunno.